Inspired by the concept of prime numbers – numbers indivisible by anything other than themselves and 1 and with no immediately apparent pattern, former Cloud Gate Dance Theatre members Bulareyaung Pagarlava (Taiwan) and Albert Tiong (Singapore) each choreographed a work attempting to unravel the mysteries behind them, showcasing how they may have more application to daily life than we think. In this double bill presentation, we opened with Albert Tiong’s The Odd One, taking inspiration from award-winning Italian author Paolo Giordano’s novel The Solitude of Prime Numbers. 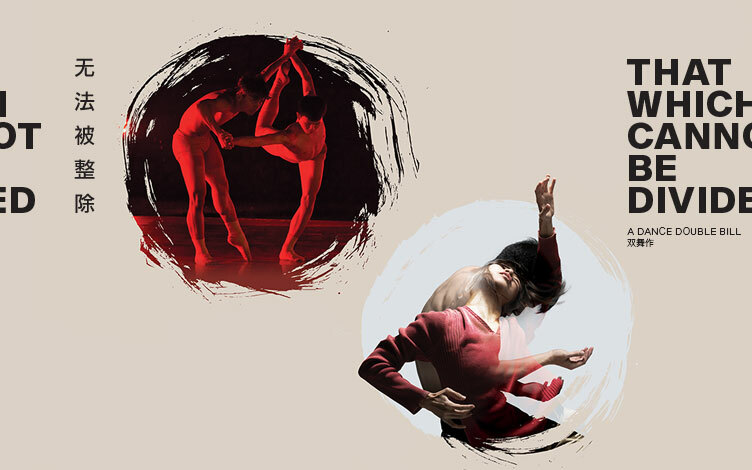 Primarily considering ideas of solitude and disconnectedness, the piece opens with a single dancer onstage clad in layers upon layers of clothes, completely engulfed and slowed by their sheer weight. While five more dancers begin to join her on stage. She then begins to remove pieces of clothes layer by layer, as if she is shedding some form of emotional armour or ‘masks’ she puts on in public and the emotional baggage she is carrying. While meditative music by Mervin Wong plays in the background, as if coaxing us to close our eyes, breathe, and let go as she engages with this ritualistic disrobing. But what lies beneath the layers is not a form of nirvana – instead, the dancer is left looking lost and confused as to what should come next. In her confusion, she then stands still, and the dancers begin to run around her aimlessly, no knowledge of who or where to turn to. 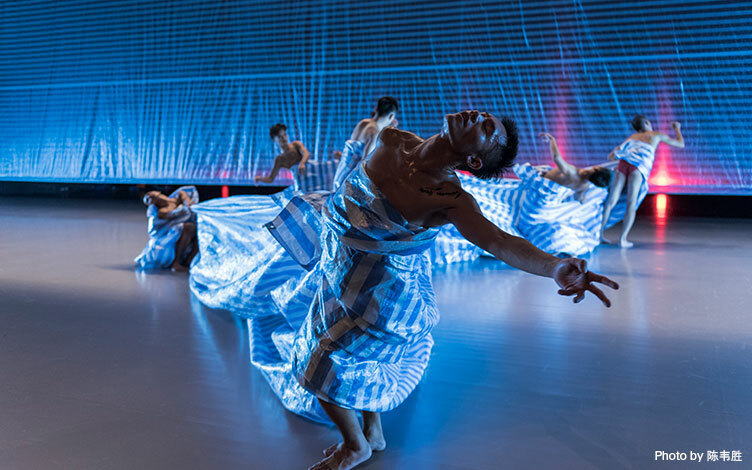 Now, the other dancers attempt to connect, to commune – with Gabriel Chan’s smart lighting choice effectively making us feel like we were in a different place. The theatre silenced, the lights dimmed, we hear only footsteps and the distinct sounds of dancers’ breaths, as Kelvin Chew’s multimedia projection mapping took us straight into a ‘matrix’. Emerging from this transformative ‘matrix’, the dancers now find their ground in this new world. Now as they almost gather the articles of clothing on the floor, as if they have now seen the light, the patterns of prime numbers, so to speak, and understanding this logic, easily find the clothes that fit them just right, each of them now in complete sync and understanding of each other as they move, coexisting at last as the differences are now removed, no longer lonely primes, but primes, together. The double bill continued with Bulareyaung Pagarlava’s 0 in 1, an extension of his previous work Colours (2016) created when Taiwan was hit by Typhoon Nepartak. In a sense, 0 in 1 acts as a hypothetical solution to the aftermath of a disaster, figuring out how best to recover and learn to live a normal life again, as if one’s identity has been swept away by the waves itself. In his interpretation, that comes from finding a sense of community, as we are introduced to the eight dancers performing this piece. All dressed like construction workers in signature rubber boots, one imagined them to be on break as they lay down on the tarp covered floor. Each dancer with a unique body, unique dance vocabulary and unique movement, a single dancer (Tseng Chih-Hao) stands up and begins to dance. A solitary figure, his moves are unconventional, as if goofing around in an attempt to entertain the others, as they watch and laugh. Yet, it is not long before the others get up and follow suit, coming together to form an organised pyramid shape as they dance together, chanting and laughing and having fun as a single unit, showcasing immensely infectious energy and togetherness that draws audiences in. The dancers then strip down to their underwear, baring themselves, their souls to the audience as they come closer, interacting and engaging with us smoothly and drawing up further into their world and rituals, building a sense of community. They then pick up the tarp on the floor, imaginatively wielding it to form new shapes. Under Lee Chien-Chang’s lights, the tarp seemed to illuminate as one dancer spread it full from left to right, attempting to connect the corners of the tarp to the corners of the stage. Each time he lifts the tarp, it billows and there is a rush of sound akin to waves on the sea, in part due to the lighting on the tarp and the pockets of air that arise from it. One is reminded of Taiwan’s status as an island, imagining the beaches and the watery vortex of the typhoon that struck in 2016 as the tarp is thrown into the air by 2 dancers, each holding a corner of the tarp. Another dancer comes, a body thrown about by the chaotic ‘waves’, and it strikes us how something so beautiful can be so calm in one moment and disastrous the next. 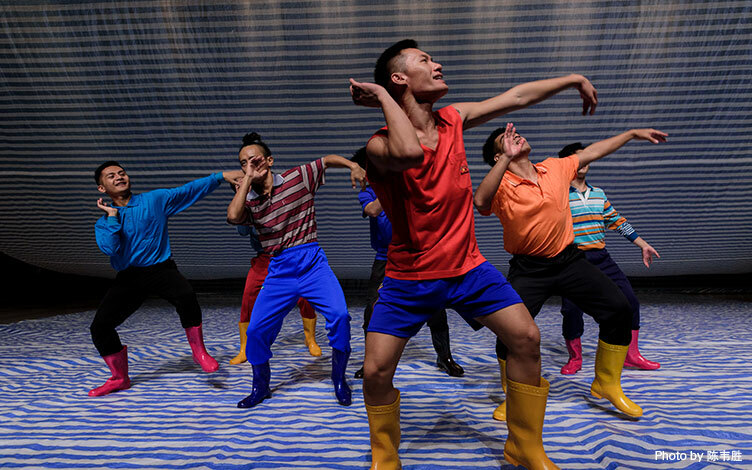 The dancers are then divided, with seven of them wearing the rubber worker boots, one wearing high heels instead. Differentiated and apart from the rest, he finds it difficult to keep pace with the rest of this community. As The others continue to chant, to keep the momentum going and keep the spirits up as they choose not to abandon but stay together, he then puts on his worker boots again and joins them again. What was interesting in this piece is a particular segment when each person does a chore individually, to little effect, but when all eight come together to accomplish something, they do it with flying colours, a representation of how they have come to recover as a community together after the typhoon, in spite of their differing identities and personalities. The only way is forward – and not to dwell on the past. They have fun, they laugh, they let go and enjoy in this unorthodox yet relatable performance of finding solace in each other in the greatest times of need, and one cannot help but root for them as they hold on to each other, filling the Esplanade Theatre Studio with positive, infectious energy, rippling out towards the audience and filling us too with the assurance that we’re all together in this to support one another after a crisis. We cannot be divided and brave the storm as one.